The recipe today is one that I have been searching for for a long while. A few years ago my mother told me about a jam cookie with walnuts that she was in love when she was younger, and that my grandmother loved too. Unfortunately the exact recipe had been lost over time though my mother swore it was called "Swedish Something." I had been looking for it ever since, but the only recipes I found were closer to thumbprint cookies than what she was describing. Then, a few days before Christmas, my mother drops "Swedish Strips" on me, and a couple of minutes later I had a recipe and a plan. 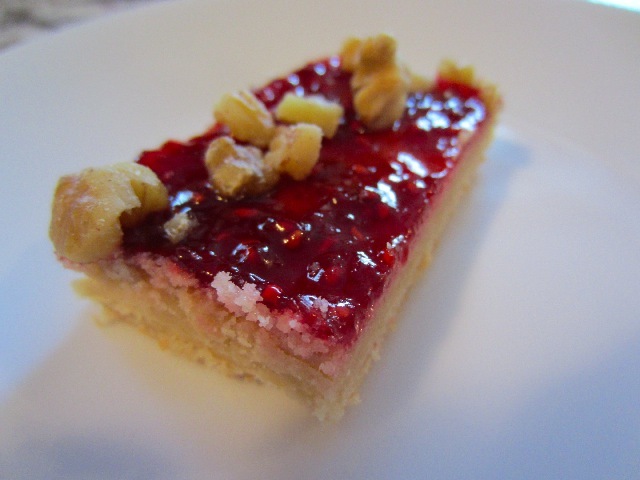 Although, we decided on raspberry jam and walnuts because my mother very specifically remembered those details, we didn't alter the basic cookie recipe. However, my mother was pretty sure that she had used butter rather than shortening. Our only issue in preparing the recipe was the size of the cookie sheet we were using. Ours were a little big, making it a difficult to roll the dough out uniformly. It's not something that is going to make or break the recipe, but it will change the look of your cookies and how thick they end up being. The cookie baked up really nice, and once dressed with the jam, walnuts and dusted with powdered sugar really gave the feeling of Christmas, and they tasted fantastic. 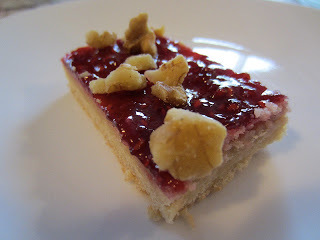 The cookie portion wasn't too sweet, and when combined with the walnuts, really helped to balance out the sweetness of the jam. Of course if you wanted to go full bore you could make your own jam too, giving you even more control of the results. I think if there was one thing we would change it would be to have a thicker cookie layer overall. No doubt because of the issue we had with the pan size, the cookie in certain spots was a bit thin. As a result the cookie to jam ratio was a little low. My mother also remembered the cookie being softer, more cake like, rather than crispy, as some pieces were, which I would ascribe to rolling out the dough thin and using shotening over butter. But these are small gripes for such an excellent and super easy jam cookie, especially one with a tonne of possible variations. Peanut Butter Swedish Strips anyone? Preheat oven to 350F and grease a cookie sheet with raised sides. In the bowl of a mixer cream together shortening and brown sugar. Beat in egg, vanilla, and salt. Reduce mixer speed to low and slowly add flour. Mix until combined. Remove dough from mixer and press into prepared cookie sheet, flatten by hand to 1/4 to 1/2 inch thickness. Evenly spread jam overtop of warm cookie. Evenly sprinkle walnuts overtop jam.